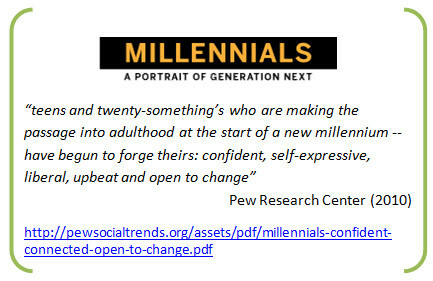 What does it mean to be Millennial and why does it matter? personal networks, even those whom consider themselves ‘up to date with current affairs’, are completely unaware of just how close we are to the reality of an e-government. In fact a number of them seem overwhelmed and “scared” of the overall concept. 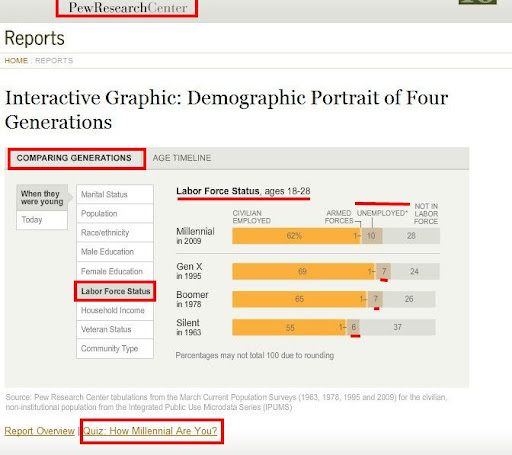 Demonstration of critical importance of building the confidence of the general public, especially those whom like me fall into the “millennial” generation. As we have grown up as the “always connected” generation, maturing and coming into a world saturated with digital technology and social media (Pew Research Center, 2010). But rather than our intuitive perception that this has ensured our place as the “privileged generation”, these influences and trends may have just hindered our progression in the digital environment more than we widely acknowledge. As our parents struggled with the increasingly open nature of the world we were born into and the processes and structures established and modelled by generations before us, cracked under the pressure of the information age, we learned to ‘cast a wary eye on human nature’ (Pew Research Centre, 2010). We consider ourselves to have a distinctive identity and claim our uniqueness, however, we are not unusual in that sense, more than half of those from generations before ours felt the same way. The technologies we have experienced emerging through our youths and the influence and effect of these on our societies and economies are however distinctive from our elders. The quality of the models of use we have been provided throughout have not been directed with highest concern for efficiency and development. The models of how we understand and utilise these technologies and protect & limit our connectivity in our digital realities as “millennial’s” causes a interesting dichotomy in our values. We are less tied to religion (despite reportedly still praying about as often as our elders did in their youth) or war than generations before us, remembering that those of us whom were born in Australasia have no living experience of “world war”, for most of us, the September 11th attacks we watched on the TV was the closest we have come. Assumed to be at least in part a result of our saturation with multimedia continuing throughout our lives, we ‘embrace multiple modes of self expression’ (Pew Research Centre, 2010). Labelled with “look at me tendencies” we are significantly more tattooed and pierced than generations before us and despite seemingly sharing the same family focus, we don’t seem to be in a hurry to fulfil these priorities and a significant number of us have increasingly returned to our parents homes through recent economic struggles. Which mean it’s a good thing that we get on with our elders, few of us see the gap source of conflict. Pew Research Center (2010) reports claim this poor economy, which many of us graduated into, will see us suffering long term consequences with Millennials already receiving the claim to the highest rate of unemployment amongst their age group for more than three decades. These same struggles have been to blame for the increasingly significant amount of us whom are out of work. (NZ STAT). Despite this difficulty we seem upbeat and most of us aren’t all that stressed about money, which in combination with our self confident claims of moral superiority, which we seem to display little appetite for in practise, which lend us to being the recipient of the typical older generation gripe of “kids today” (Pew Research Center, 2010).We actively engage with social media, ‘one in five of us have hosted a video online’, we still represent a significantly higher proportion of the time spent using these ICTs and SNSs than our elders (Pew Research Centre, 2010). Unlike the generation X or baby boomers, we are disconnected from a world without ICTs, “the old model” is lost on us and our experiences of life in the “old days” are memories of our childhoods in the 80’s and 90’s. or potential employers went looking for our Facebook profiles, but then when our parents started to add us, well a whole new barrage of concern over privacy settings arose. But can you blame us? Most businesses solved the rise of increased use on SNSs by banning their use in offices (NZ herald ref), then only a few years later, we are being told to build our careers through these same technologies. it is still largely ‘fused into our social lives’ (Pew Research Center, 2010). Unlike the generation under ours, which will never know a reality which didn’t feature digital technology, it seems we are somewhere stuck in between the technically limited and technically enabled; somewhere is an overwhelming swamp of information. In a reality where eight in ten of us sleep with our cell phones next to the bed, it is little wonder we struggle with the “hyper-connectivity” of our realities. Jones & Fox (2009) made further considerations into the varied use on online technologies between the generations and their findings supported the concept that it may counter intuitively be in fact the Millennial generation whom who is really limiting the potential for us to experience significant benefits from full integration and acceptance of our digital realities. The found that ‘contrary to the image of Generation Y as the "Net Generation," internet users in their 20s do not dominate every aspect of online life: Generation X is the most likely group to bank, shop, and look for health information online. Boomers are just as likely as Generation Y to make travel reservations online. And even Silent Generation internet users are competitive when it comes to email’ (Jones & Fox, 2009). “The largest percentage increase in Internet use since 2005 has been in the 70-to-75 age group, according to the Pew Internet and American Life Project. The survey found that 45 percent of that age bracket is online, compared with 26 percent in 2005” (Moos, 2009). “In weighing their own life priorities, Millennials (like older adults) place parenthood and marriage far above career and financial success. But they aren't rushing to the altar. Just one-in-five Millennials (21%) are married now” (Pew Research Center, 2010). “in 2006, more than a third of 18 to 29 year old women who gave birth were unmarried. This is a far higher share than was the case in earlier generations” (Pew Research Center, 2010). ”About one-in-eight older Millennials (ages 22 and older) say they've "boomeranged" back to a parent's home because of the recession.” (Pew Research Center, 2010).